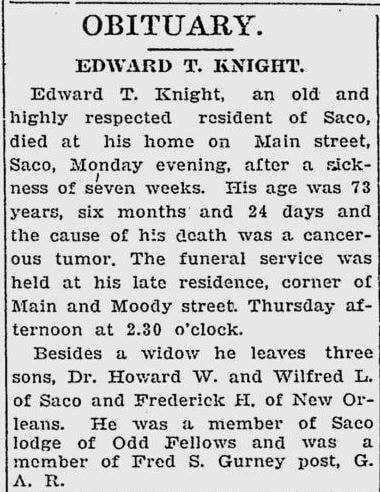 EDWARD T KNIGHT was born in Alfred, Maine [enl papers; obit; death rec] on 6 Oct 1832 [calc from age at death], the son of Daniel and Catherine (Sawyer) Knight. He died in Saco, Maine on 30 Apr 1906, aged 73 yrs, 6 mos, 24 das [ME vr], and was buried in Laurel Hill Cemetery. He was married, on 16 Jan 1858 in Saco, Maine, to SARAH CHRISTIANA BOOTHBY. The daughter of James and Mary (Loveitt) Boothby [ME death rec], she was born in Cape Elizabeth, ME on 2 May 1837 [ME vr]. She died in Saco on 20 May 1914, aged 77 yrs, 18 das [ME Death Rec; obit], and is buried in Laurel Hill Cemetery, Saco. ​ According to his obituary (see below), Edward moved from Alfred to Limerick around 1844 when "about 12 years of age", but this is in error, as family was already there by 1840 census (and his younger siblings list Limerick as birth place). He went into the carriage making trade, moving to Saco prior to 1860, where he was employed by Owen Chadbourne for some 20 years. He was also a pattern maker for the York Manufacturing Co, a position he held for 35 years, according to his obit (these trades must have overlapped, as the numbers don't add up). In 1900, he moved to Kittery and worked on the shipyard, but retired due to sickness a year prior to his death. He attended the School Street Methodist Church in Saco, a member for over 40 years, and served on the board. Following his service with the 27th Maine, he would enlist with the navy, signing up in Portland on 31 Aug 1864. He served until being discharged on 15 June 1865. He was a landsman on the USS Sabine, USS Mahaska, and USS Ohio [*see notes]. Edward had two brothers who served and died during the Civil War: John Knight, aged 19, was in Co. E, 9th Maine Infantry, and died of disease in Washington, DC on 1/7/1862 [grave; US Reg of Deaths], and Charles H Knight, who enlisted with the 17th US Infantry on 8/21/61, at age 22, died in Annapolis, MD in May 1862 [5/2 on grave, 5/7 listed in US Army Enl Monthly Rep't]. i. HOWARD WEBSTER KNIGHT, born 31 Aug 1858 [Pension Papers] in Saco, ME; died 1937 [grave]. Married to ALFREDA B LIBBY, dau of Sewell M Libby. She was born in Jan 1860 [1900 census; grave], died in 1928. Both are buried in Laurel Hill Cem, Saco [YCCI, pg 1555]. Howard was a music teacher in 1880 [census], but followed that by attending Dartmouth College (Class of 1899) to study medicine. Later censuses listed his occupation as a physician, a commercial traveler selling drugs/medicine, as well as an advertising manager and med. chemist. 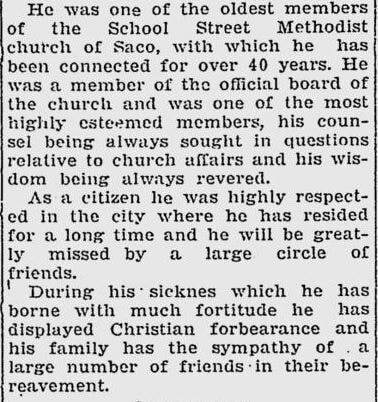 He left Saco for Dorchester, MA in 1899, returned home in 1907 [recs of Baker Memorial Methodist Church of Dorch. ], afterwards leaving for Salem, MA and Portland, ME. ii. FREDERIC HARRISON KNIGHT, b. 22 Oct 1859 [Pension Papers; MA Mason Member Card] in Saco; died in Brookline, MA on 15 Oct 1922. Married 22 Sept 1887 in Wakefield, MA [MA vr] to MARION BUTTERFIELD, the dau of George W and Sabra Butterfield. She was born in Saugus on 9 Dec 1861 [MA vr]; alive in 1940 (liv in Columbus, OH w/ son Howard). Fred attended Dartmouth Collage, class of 1882, and the Boston University School of Theology, graduating in 1885. After studying in Berlin, Germany for a year, he returned to Massachusetts, where he became a Methodist pastor. He served in several communities for many years, until becoming president of New Orleans University. 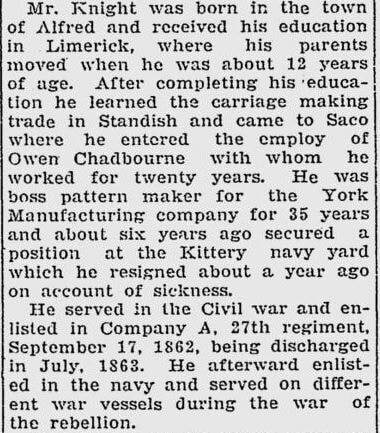 He would become superintendent of the New England Home for Little Wanderers in Aug 1907, a position he held until his death [obit, Boston Herald, 10/17/1922]. 1. Howard Roscoe Knight, b. 23 June 1889 in Boston [MA vr]; d. 1947. He was married to Pauline Helms of Boston. In 1917, was living in Freeport, NY, working as secretary for the YMCA of Nassau and Suffolk Counties. In 1922, he was at the Ohio Institute for Public Efficiency in Columbus, OH, and the Nat'l Conf. of Social Work in 1942 [WWII Draft Card]. They had a dau Jean Knight, and two sons, Howard H and Phillip A Knight, both of whom died in air crashes while in the service of their country during World War II. 2. Frederic Butterfield Knight, b. 2 July 1891 in Springfield, MA; d. 19 June 1948 in Lafayette, Indiana [IN Deaths]. He was professor of psychology at Iowa State Univ in 1922 [father's obit]. ​iii. WILFRED L KNIGHT, b. 22 Apr 1861 [Pension Papers] in Saco; died 1936 [grave]. He was married, on 29 Oct 1895 in Saco [ME vr], to MINNIE G STEARNS, the dau of Cyrus G and Mary (Farnsworth) Stearns. She was born in Lincoln, MA (some records say Hyde Park, MA) in Aug 1873, and died in 1963 [grave]. They are both buried in Laurel Hill Cemetery, Saco. She and Wilfred lived on Main Street in Saco, at the corner of Moody St, a home that Edward and his son had built (mentioned in pension papers; house no longer standing). Minnie would remarry in 1938 to Myron Pillsbury. 3. Florence Elizabeth Knight, b. 12 Mar 1902 in Saco [ME vr]; Marr in 1931 to Frederick C Shipley, a college teacher, and were living in New York in 1940 [census], with a dau Florence Shipley, age 4. 1880 Saco census (pg 14): hh 156/175: liv Main St.
* Per pension papers, Edward served on the USS Sabine (8/31/64-9/1/64), a recruiting vessel moored in Portland Harbor [Boston Herald, 9/7/64]; USS Ohio (to 12/31/64), receiving ship, stationed at Boston; USS Mahaska (to 6/6/65), on overhaul at Boston until 1/16/65, then sent to Florida for remainder of war; back to USS Ohio (disch from on 6/15/65), still in Boston Harbor. The Maine State archives index card also mentions that Edward served on the USS Cherokee, which is likely the vessel Edward took back to Boston prior to his discharge, as it arrived there from Key West on 6/12/65 [Boston Daily Advertiser 6/13/65].